Islands Festival 2010 "Fisher- men's Scenes"
Agnes B Theatre, 2 Harbour Rd, Wanchai: Fundraiser by Alba Rayton, Lammaite filmmaker. Facebook. 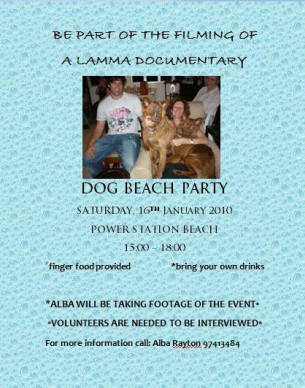 Dog Beach Party: Sat, Jan 16, 2010, 3-6pm: Power Station Beach: Filming of a Lamma documentary by Alba Rayton, Lammaite filmmaker. Volunteers for interviews needed, finger food provided, bring your own drinks. Call Alba @ 9741 3484. Facebook, poster. Lammaites Ivy Fernie - vox/guitar & Aileen Alonzo - vox/keyboard; plus Alejandro Dini - bass & Keith Woodfin - drums: "A mix of soft melodies and rhythm, coloured by words like short journeys into one's hidden world and secrets." email or call 9640 0036. 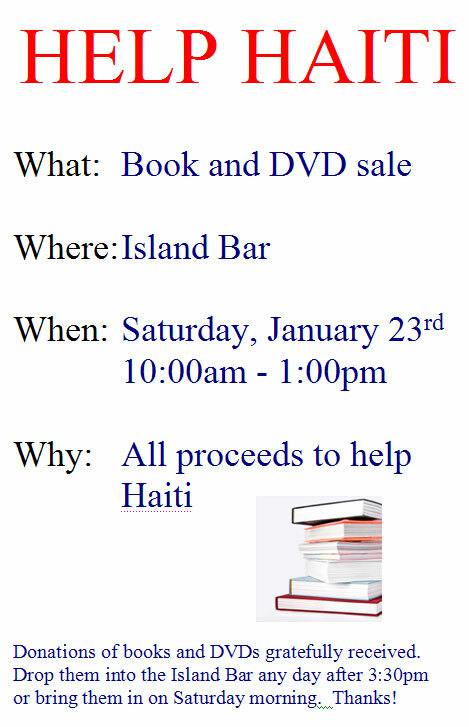 Help Haiti Sale: Sat, Jan 23, 10am-1pm: Island Bar: Books & DVDs, donate yours & buy some; all proceeds to help Haiti. 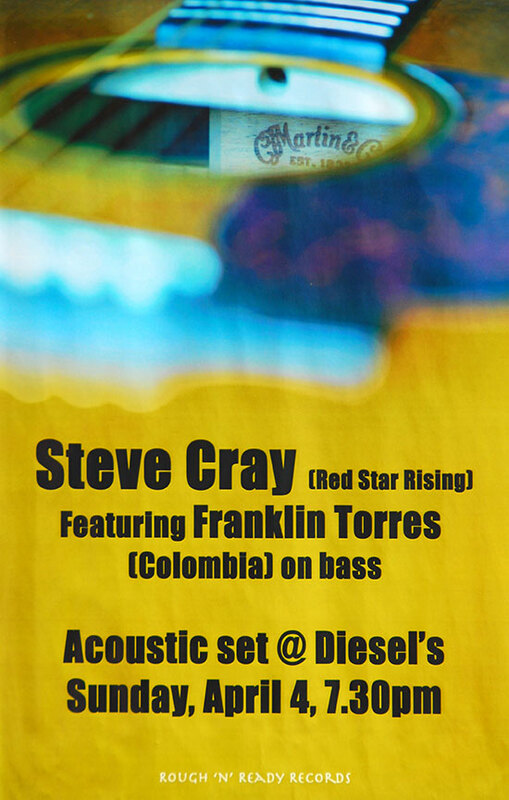 Poster. 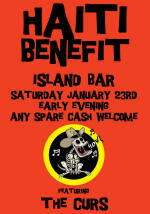 Haiti Benefit - The Curs: Sat, Jan 23, 10am-1pm: Island Bar: Books & DVDs, donate yours & buy some; all proceeds to help Haiti. Poster. 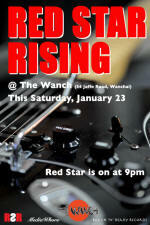 Red Star Rising: Sat, Jan 23, 9pm: The Wanch, 54 Jaffe Rd, Wanchai. Black Mariah, formerly Spicy Boys. "The Sleeves are a dish best served live. Since switching from playing indie covers to their own material a year ago, the high-intensity five piece have become regulars on the local music scene with their energetic live shows that offer "a tasty blend of Blues, Rock and Britpop" and "rock and roll plus entertainment at its best". They are currently recording two songs that will be included on the latest compilation CD to be issued by The Underground." Poster. 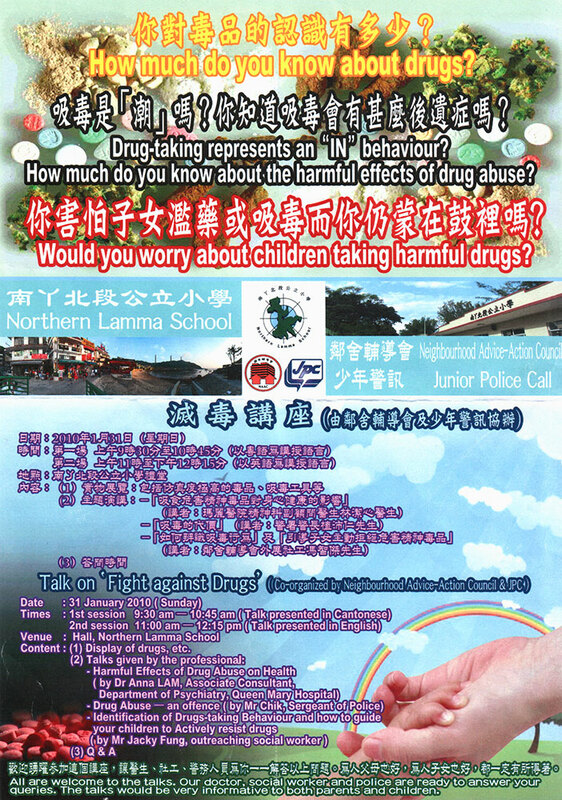 Talks and Q&A for parents & children, by Lamma police, doctors, social workers. Poster. $80/person, booking required. Make your own super-foods smoothies & dips. Poster, email, tel. 2982 2325. 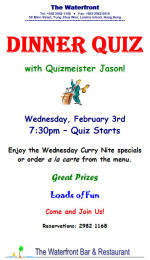 Dinner Quiz: Wed, Feb 3, 7:30pm: The Waterfront: Quizmeister Jason. Poster. 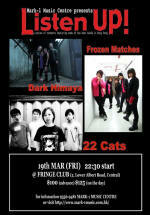 Dark Himaya: Tue, Feb 9, 9pm onwards: The Wanch, 54 Jaffe Rd, Wanchai. MySpace. 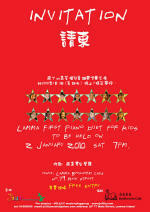 Jungle Movies: Fri, Feb 12, 6:30 & 9pm: Open Space, Tai Ling Village, below Lamma Winds): postponed due to weather! Call Tamara on 6423 1952 or email. Poster, map, directions, Facebook, website. 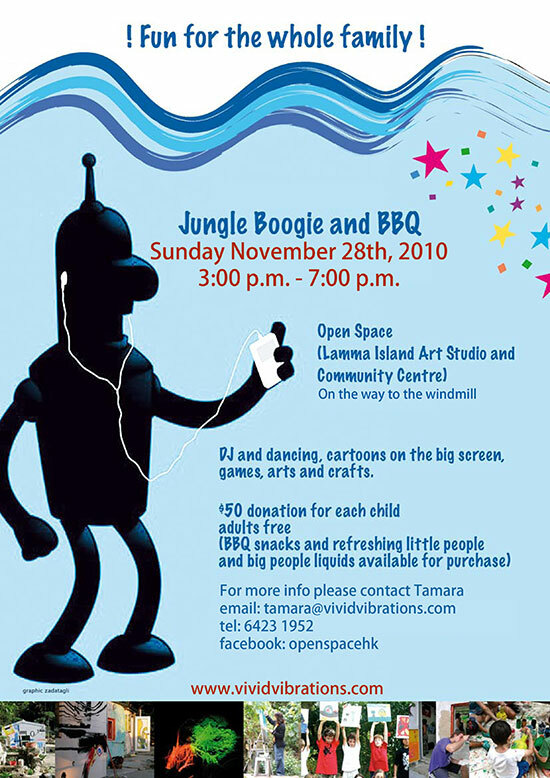 Jungle Boogie #3: Mon, Feb 15, 3-7pm: Open Space, Tai Ling Village, below Lamma Winds): Call Tamara on 6423 1952 or email. Poster, map, directions, Facebook, website. 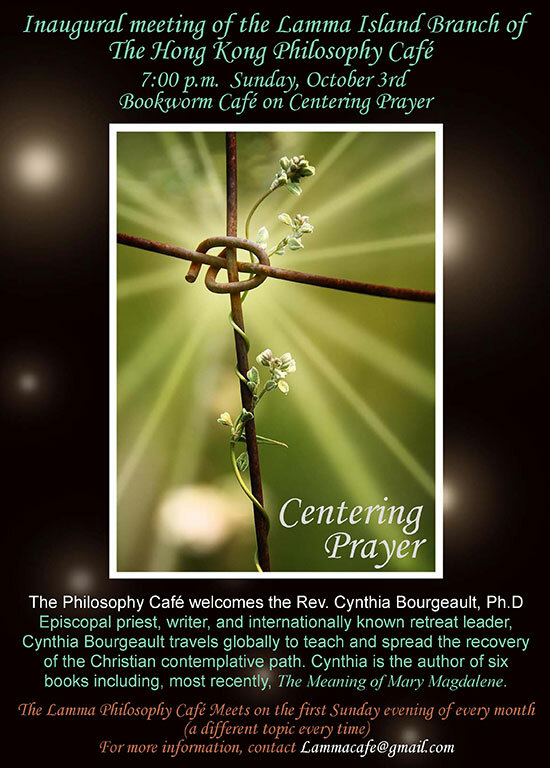 Yoga Workshops: Wed, Feb 17-23, 10am-noon or 7-9pm: Sally's Yoga studio, near Tofu Lady stall. Poster. 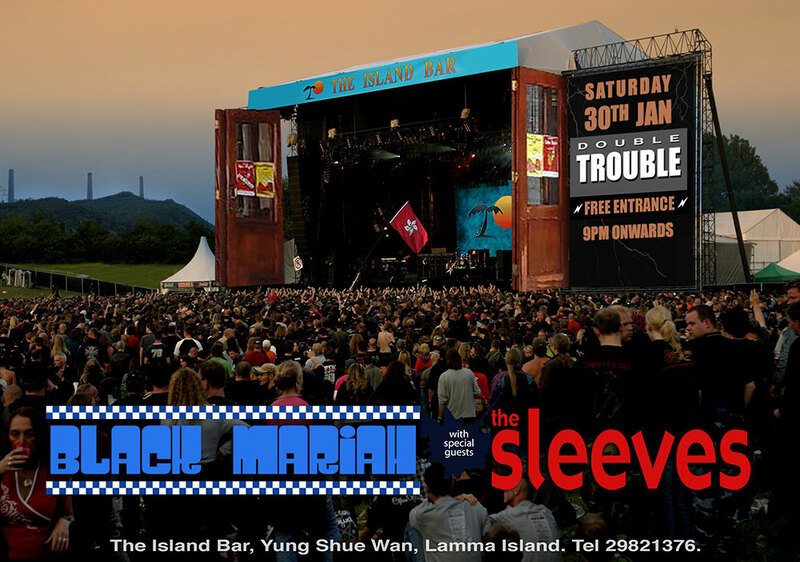 Black Mariah: Fri, Feb 19, 9:30pm: The Wanch, 54 Jaffe Rd, Wanchai. Poster. 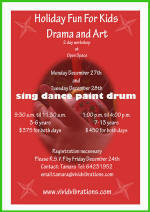 Jam Your Art Out: Sun, Feb 21, 1-4pm: Open Space, Tai Ling Village, below Lamma Winds): Call Tamara on 6423 1952 or email. Poster, map, directions, Facebook, website. 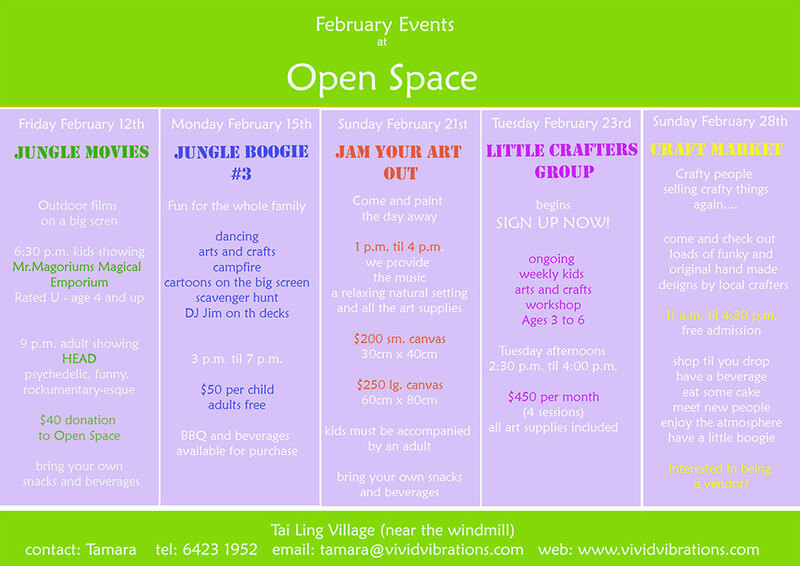 Little Crafters Group: every Tue, from Feb 23, 2:30-4pm: Open Space, Tai Ling Village, below Lamma Winds): Call Tamara on 6423 1952 or email. Poster, map, directions, Facebook, website. 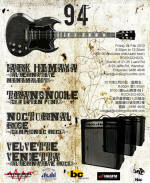 Dark Himaya & Transnoodle @ Underground: Fri, Feb 26, 8:30pm-12:30am, Rockschool, Corner of Luard & Jaffe Rd: Website, poster. 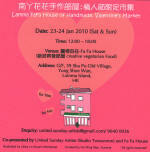 Craft Market: Sun, Feb 28, 11am-4:30pm: Open Space, Tai Ling Village, below Lamma Winds): Call Tamara on 6423 1952 or email. Poster, map, directions, Facebook, website. 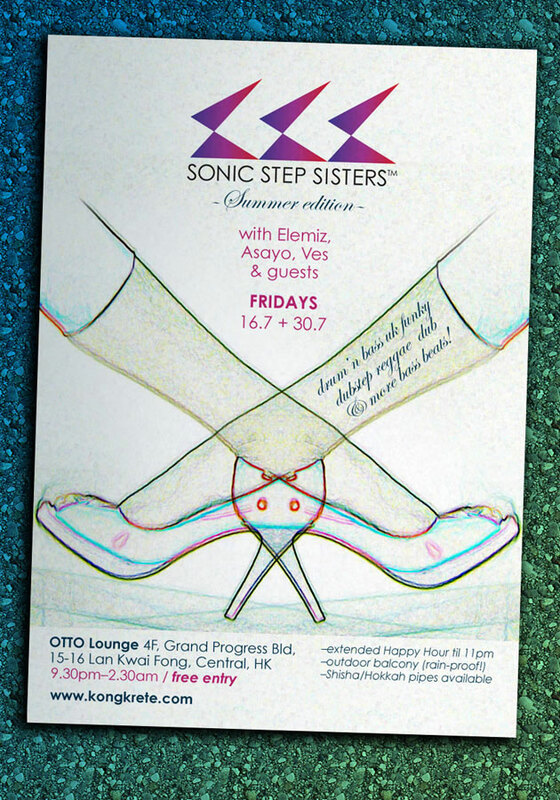 Sonic Step Sisters: Fri, Mar 5, 12, 19, 8pm-2am: Otto Lounge, 4/F Grand Progress Bldg., 15-16 LKF, Central, HK: organised by Kongkretebass.com. 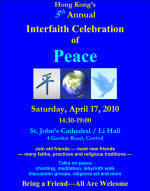 Poster, website. 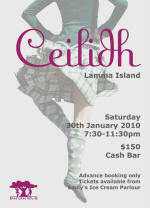 Website, poster: The gig is being filmed as part of Alba's documentary on Lamma. 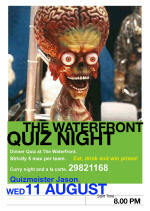 Quiz Night: Wed, Mar 10, 7:30pm: Waterfront Bar & Rest. : poster. 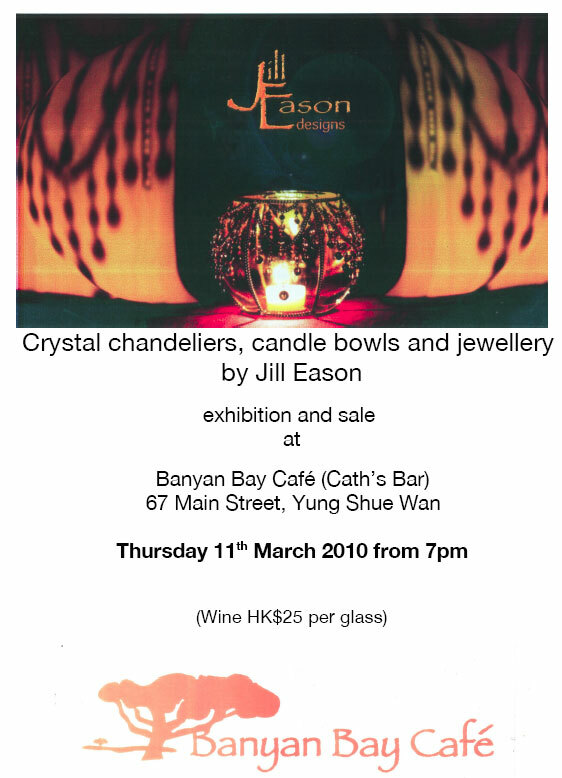 Jill Eason Exhibition & Sale: Thu, Mar 11, from 7pm: Banyan Bay Cafe, 67 Main St.: Crystal chandeliers, candle bowls and jewellery. Poster. 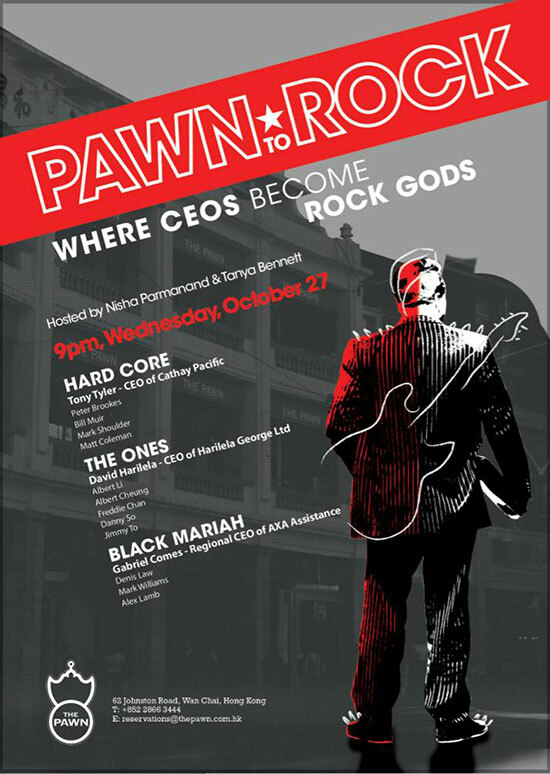 Dark Himaya & The Sleeves @ Rockschool: Thu, Mar 11, from 8pm: Rockschool, 2/F, corner of Luard & Jaffe Rd, Wanchai: Facebook, map, review, call 2510 7339 or 9813 9393. G/F 63 Back Street (before Tin Hau temple): Consecration of Canaan Church, of the Joshua Church, Hong Kong Ltd. 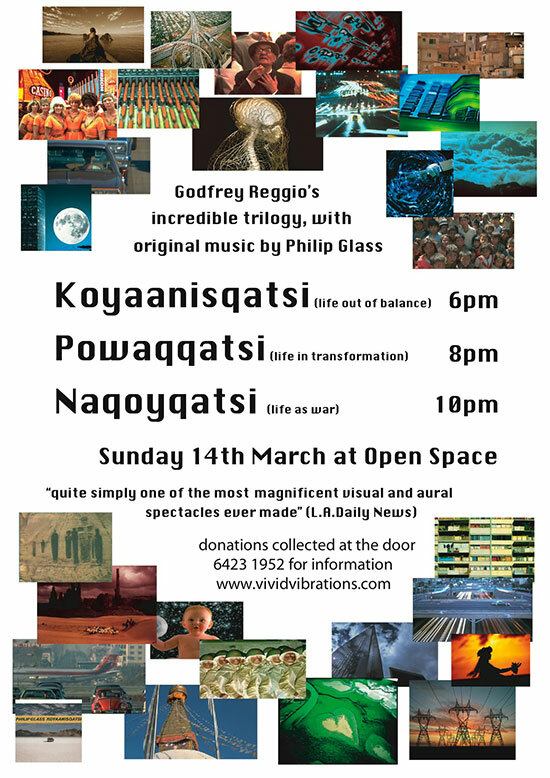 Jungle Movies: Sun, Mar 14, 6/8/10pm: Open Space, Tai Ling Village, below Lamma Winds): "Watch with us the incredible QATSI trilogy, Koyaanisqatsi / Powaqqatsi / Naqoyqatsi, with dazzling visual imagery directed by Godfrey Reggio and music by Philip Glass." Call Tamara on 6423 1952 or email. Poster, map, directions, Facebook, website, more info. Peel Fresco (map): 13. birthday jam session! 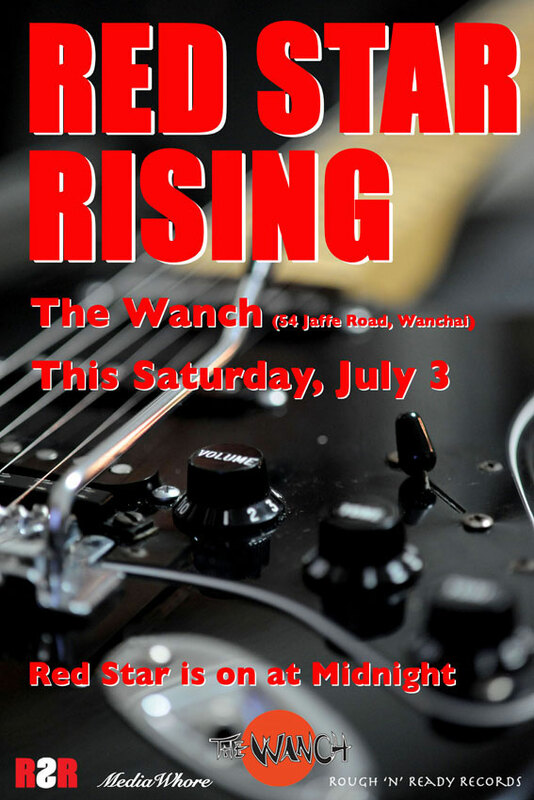 The Wanch, 54 Jaffe Rd, Wanchai: Red Star Rising's Steve Cray joins Lo Shu and Autological. DARK HIMAYA @ LISTEN UP by Mark-1. 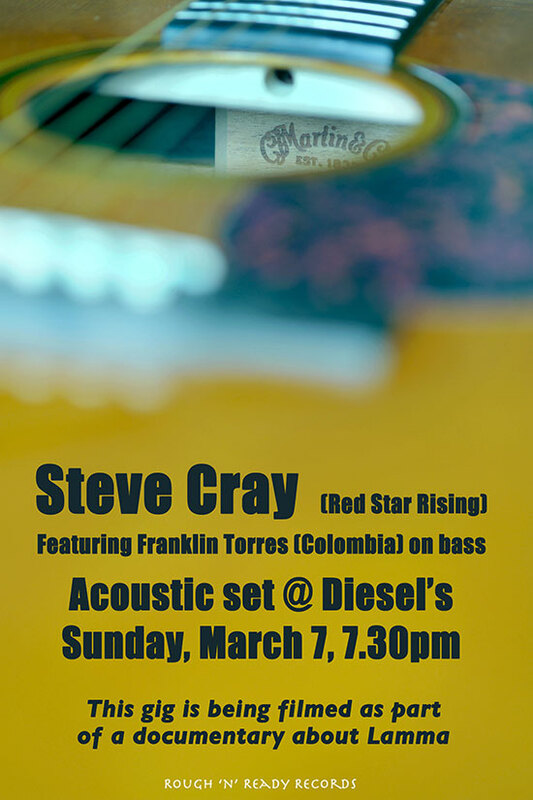 Facebook, poster, website. 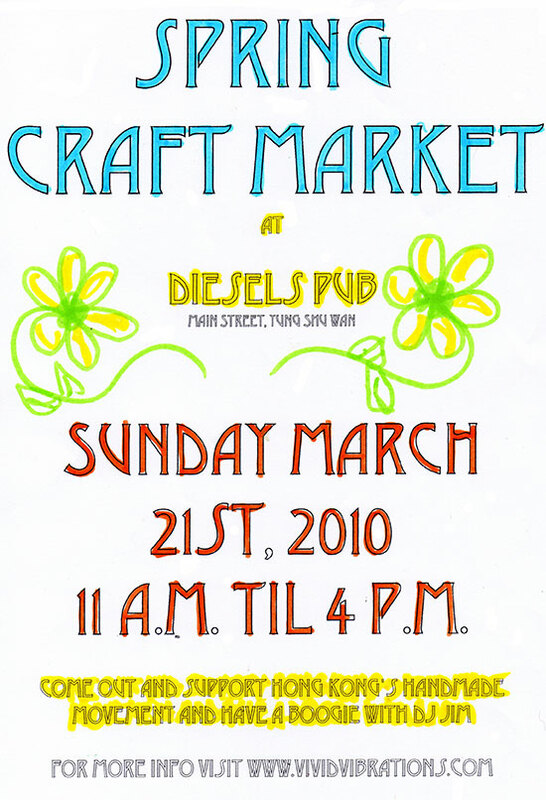 Spring Craft Market: Sun, Mar 21, 11am-4pm: Diesel's Bar, Main St, YSW: "Come out and support the HK hand made movement, crafty people selling crafty things, DJ Jim on the decks. If you are interested in being a vendor please email me or call me at 6423 1952 - $200 fee - only a few spaces left." 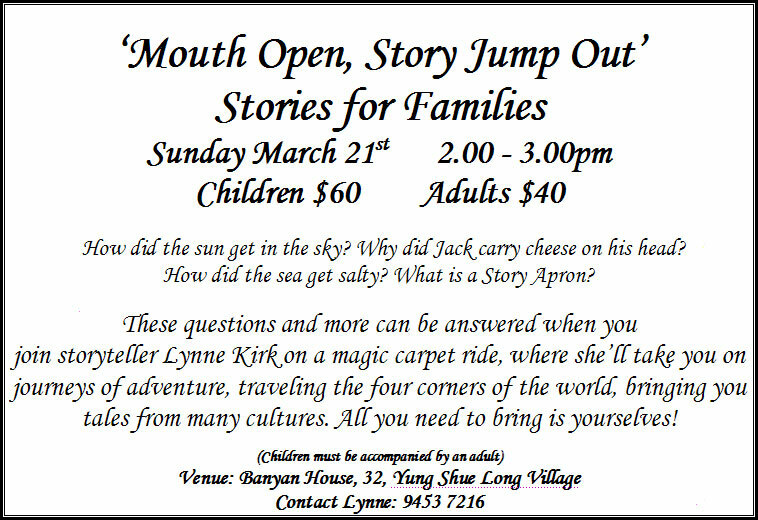 Stories for families by storyteller Lynne, children $60, adults $40: Website, poster, call Lynne @ 9453 7216. These two Lamma Bands will be performing, plus Cambodian Space Project. 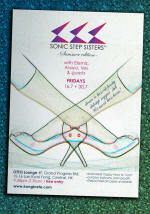 Ladies Night, all drinks are 2 for 1 for all female music lovers. 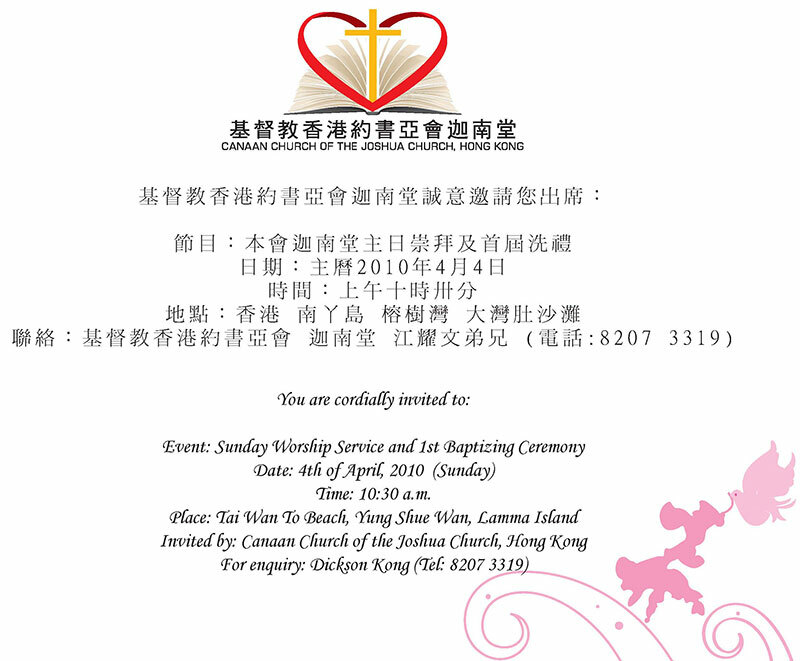 Tai Wan To/Power Station Beach: Invited by the new local Canaan Church, Tel 8207 3319. Tai Wan To/Power Station Beach: 2-12-year olds, reservation absolutely required, till Mar 14 for Lammaites, Mar 15-21 for others: Lamma Church of Christ in China, 45 Po Wah Yuen, Tel: 2982 0316, 2982 1459; 1 Back Street, Tel: 2982 1459. SOLD OUT! Photo galleries of last year's egg beach hunt. 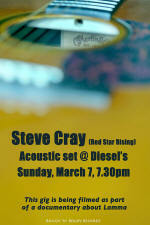 Website, poster: Prof Red Star impersonating the Easter Bunny? 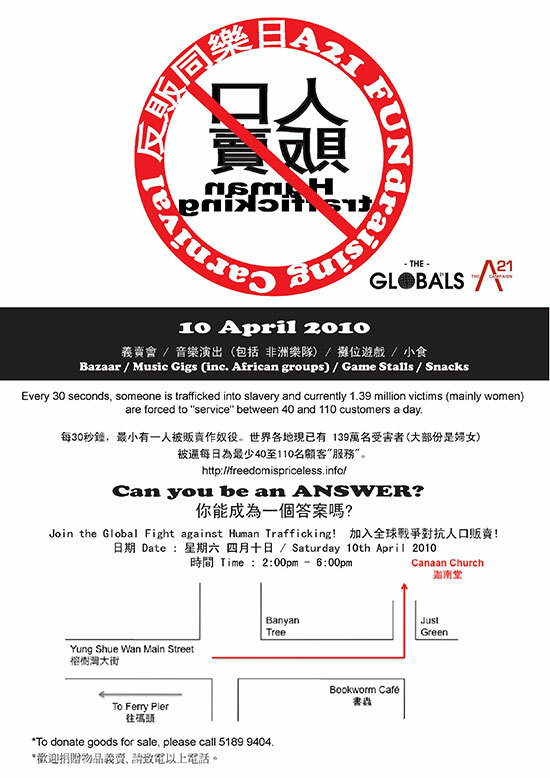 "Join the global fight against human trafficking! To donate goods for sale, please call 5189 9404." Poster, details, website, email, map. 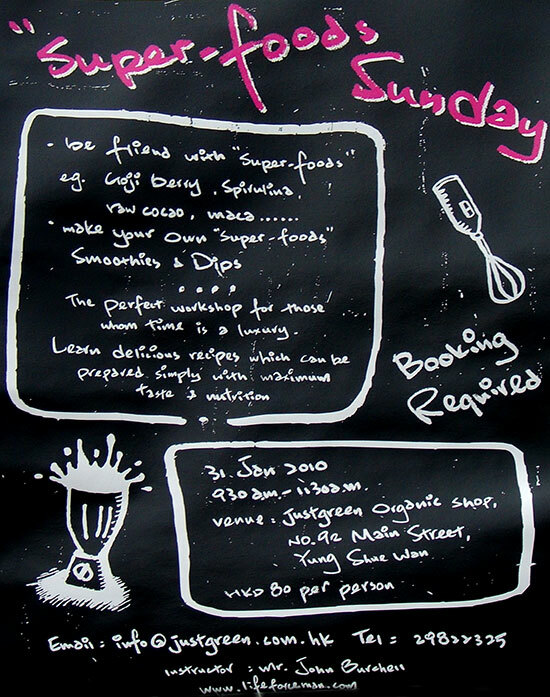 Every Sun, from Apr 11, 10:30am: 63 Back Street, Sha Po Old Village: Email, map. 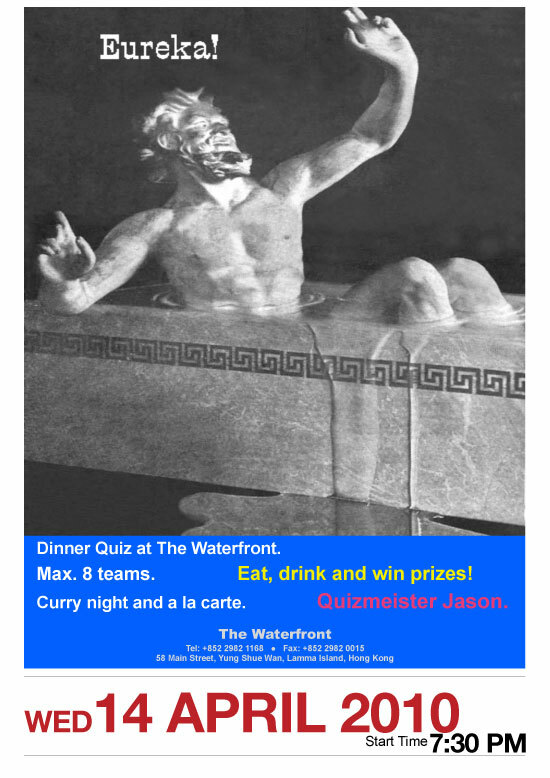 Quiz Night: Wed, Apr 14: The Waterfront. Poster. 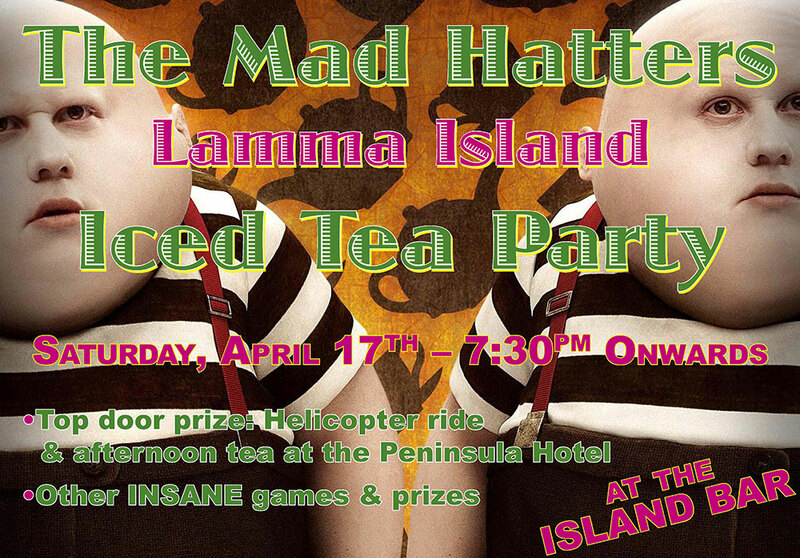 Mad Hatters Iced Tea Party: Sat, Apr 17, 7:30pm: Island Bar: Lamma Dragons Fundraiser. 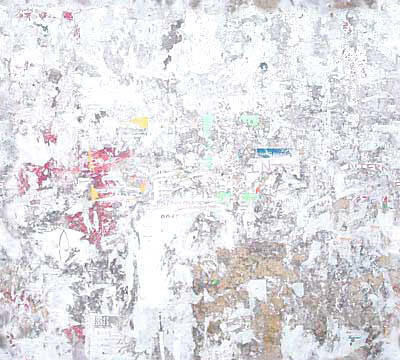 Poster, Facebook, Lamma-zine. 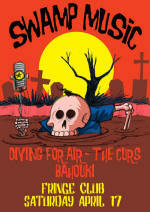 SWAMP MUSIC - Bahouki & The Curs: Sat, Apr 17: The Fringe, Central: Poster. "Bahouki has long been the #1 Celtic party band round these parts and will kick off the night with classic Irish tunes and songs propelled by Dave May's furious fiddle, grounded by Neil Art's big bad bass and topped off with John Hutton's wondrous warble. Up next are The Curs aka The Yung Shue Wan Curs who seldom leave their secret Lamma enclave where they have been causing a ruckus for many years with their trashy country songs and hillbilly gospel anthems. 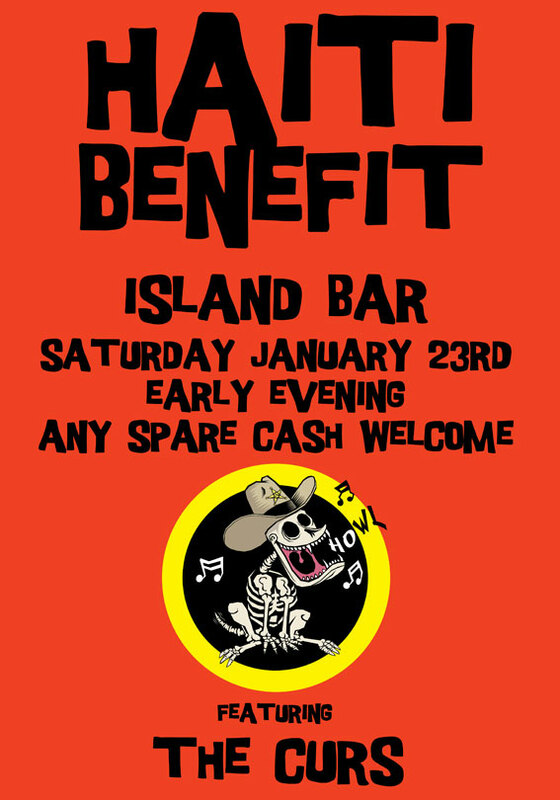 Harry Harrison harmonizes with Johnny Cashless aka Squinty John and is joined by Gareth Dunster on bass or washtub and special guests like Wavey Davey May." 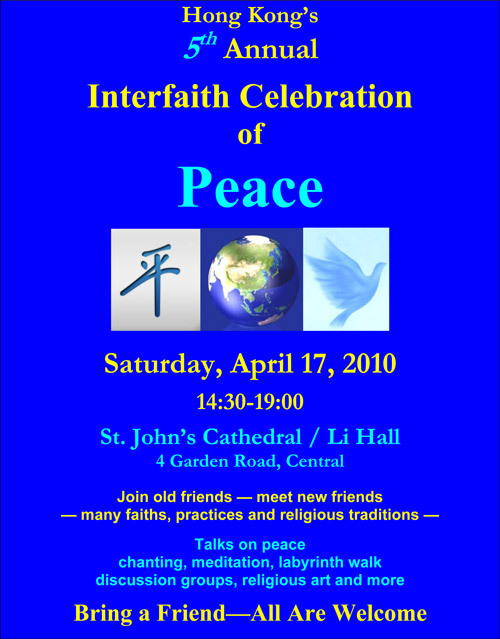 Li Hall, St. John’s Cathedral, Central: "Featuring hare krishnas, buddhist, christian, islamic, hindu, jewish, earth-based and other faiths as well as a labyrinth." email, website, tel 9270 0654. 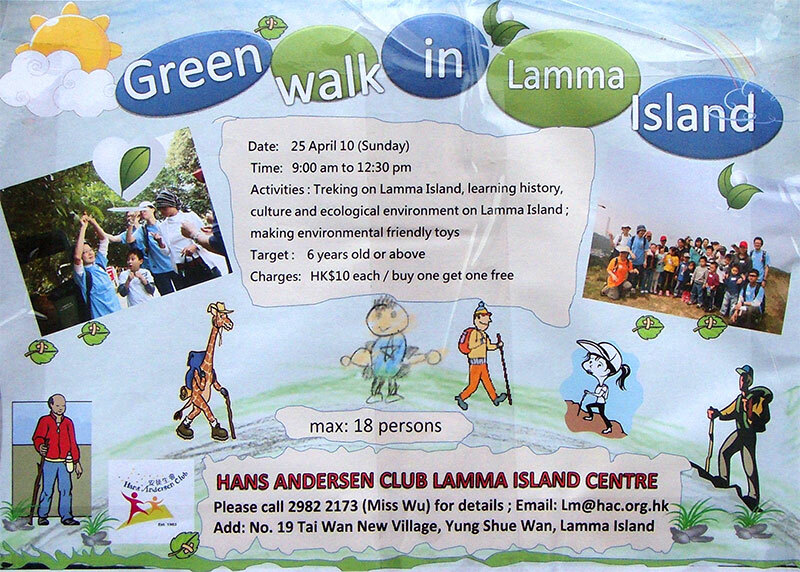 Green Walk: Sun, Apr 25, 9-12:30: Hans Andersen Club Centre. Email. Poster. 6 years and above, $10, buy 1 get 1 free. 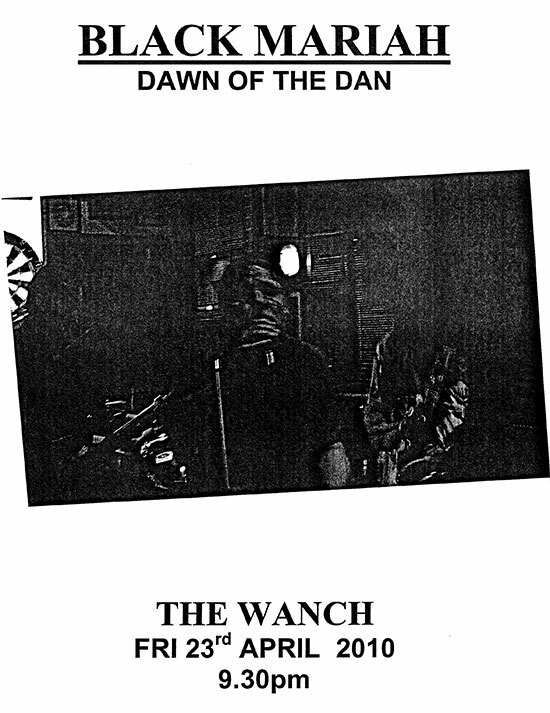 Dawn of the Dan: Fri, Apr 23, 9:30-11pm: The Wanch, 54 Jaffe Rd, Wanchai: Poster, photos. Dan's birthday! May Pole Dance: May 1, 4:30pm: Power Station Beach. Hike to Tung O Wan: May 1, 9am-4pm: Start at Hung Shing Yeh beach: Details, Facebook, Registration & enquiry mail. Cantonese Opera Performances: Wed, May 5 - Sun, May 9: YSW Football Pitch: Performed by Hing Fung Ming Cantonese-Opera Troupe. Part of Tin Hau Festival/Lamma Day. Poster. 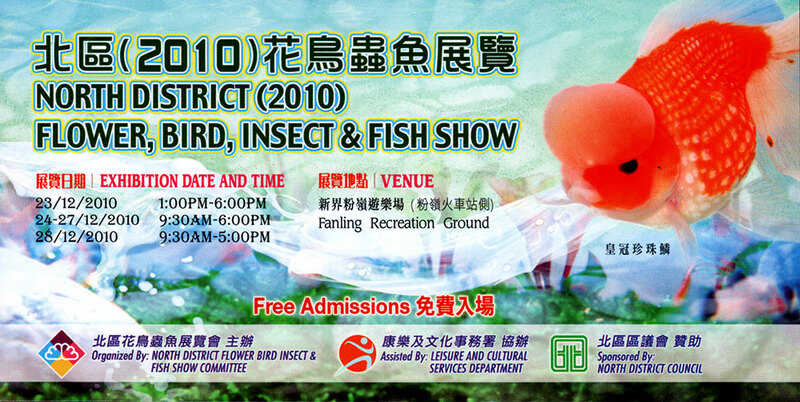 Lamma Day: Thu, May 6, 10am-2pm: Public Pier behind Football Pitch: Tel 2982 0350 (Ms Leung). Dragon Boat & Sampan competitions. Details. 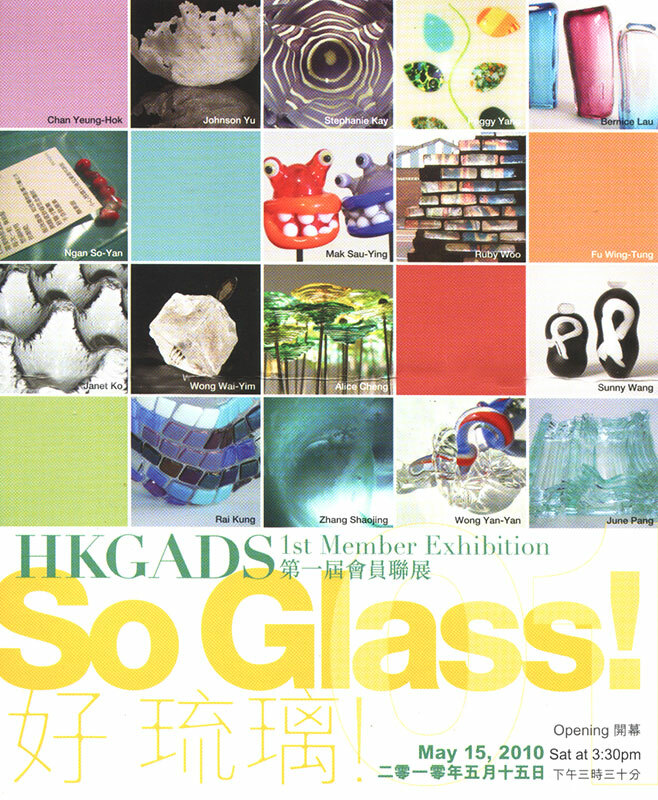 Glass art exhibition, incl. 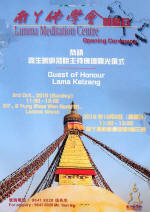 Lamma artists, May 15-17, 19-22, 10am-8pm: details, tel. 8131 4947, email, poster. 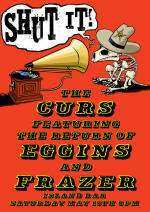 The Curs: Sat, May 15, 8pm: Island Bar: feat. 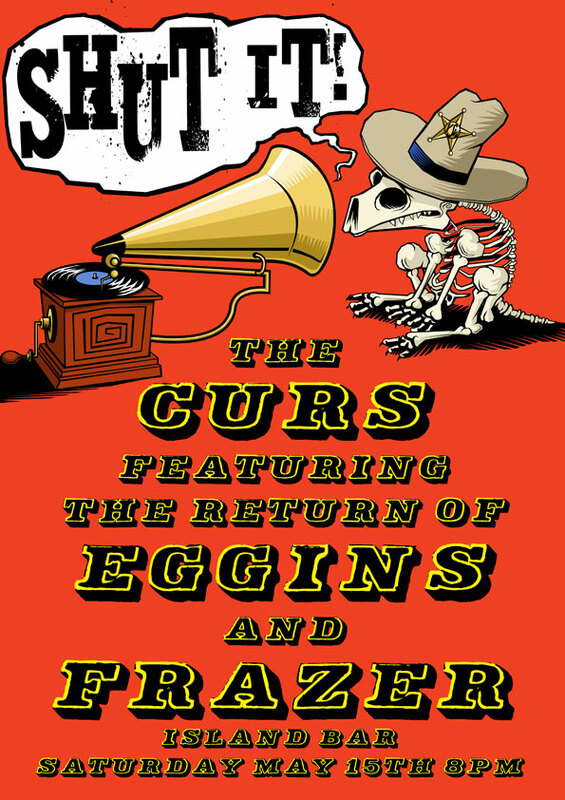 the return of Eggins and Frazer. Poster. 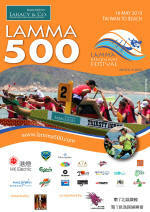 Lamma 500: Sun, May 16, 9am-5pm: Power Station Beach: Website, poster. 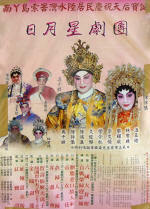 32 Yung Shue Long Village: $60/child, $40/adult, by Lynne the Storyteller, call 9453 7216. 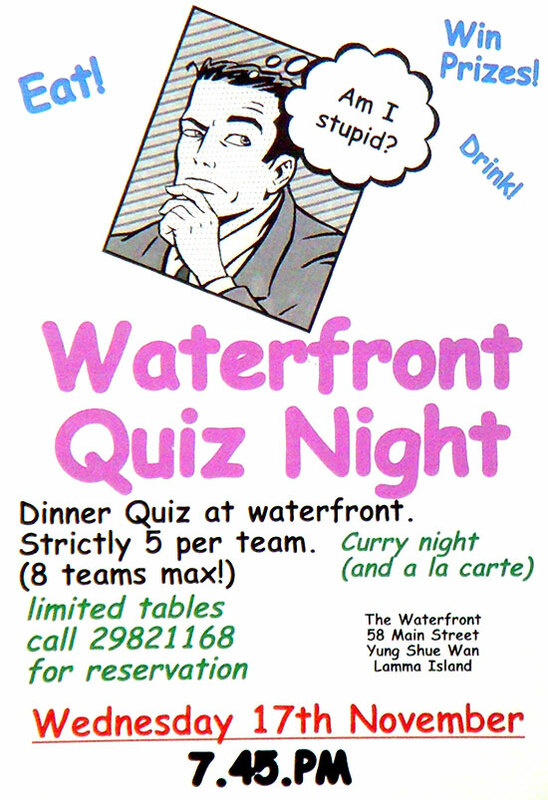 Quiz Night: Wed, May 19, 2010, 7:30pm, The Waterfont Bar & Rest. : Poster. Canaan Corner Opening Ceremony: Fri, May 21, 1-4pm: Sha Po Old Village, Yung Shue Wan: Community Corner of new Canaan Church. Poster. 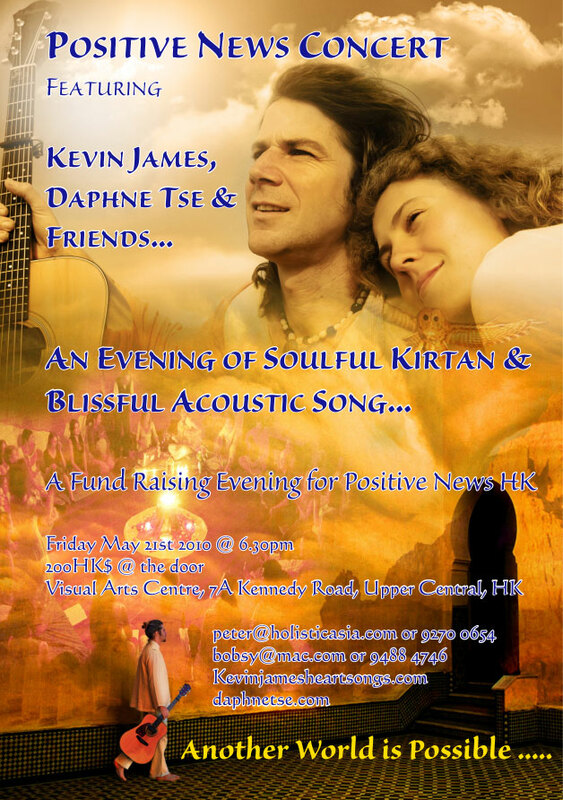 Fri, May 21, 6:30pm: Visual Arts Centre, 7A Kennedy Rd, Upper Central: "An Evening of Soulful Kirtan and Blissful Acoustic Song..." Fundraising for Positive New HK. Poster. 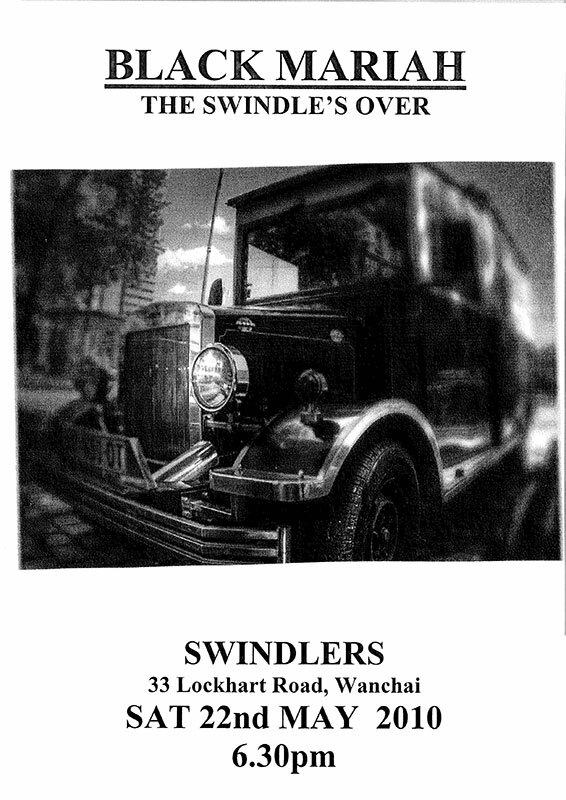 Swindlers, 33 Lockhart Rd, Wanchai: Poster. Sun Moon Star Cantonese Opera Troupe: Fri, May 28 - Tue, Jun 1: opposite Tin Hau Temple, Sok Kwu Wan: Poster. Tin Hau Festival: Mon, May 31: all over Sok Kwu Wan: Celebrations around Tin Hau Temple and Dragon Boat Races in Picnic Bay. 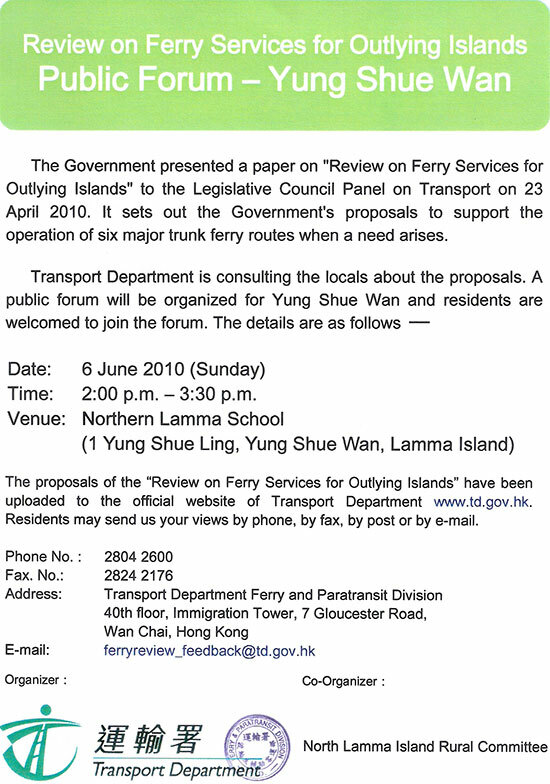 Public Ferry Meeting: Sun, Jun 6, 2-3:30pm: Northern Lamma Primary School: Poster, story. 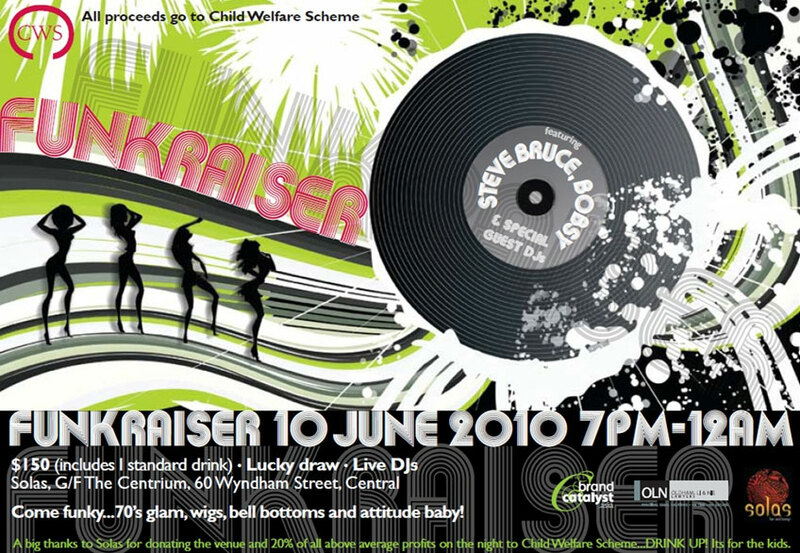 Funkraiser: Thu Jun 10, 7pm-midnight: Solas, G/F The Centrium, 60 Wyndham St, Central: $150, profits to CWS, the Lamma Fun Day charity. DJs Steve Bruce, Bobsy and guests. "Come funky... 70's glam, wigs, bell bottoms, and attitude, baby!" Poster. 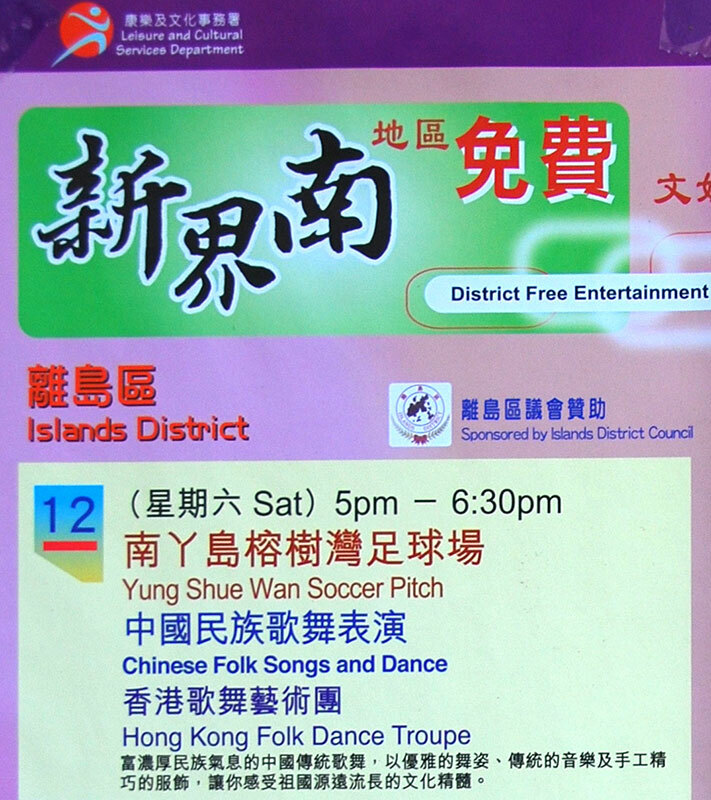 YSW Football Pitch: by HK Folk Dance Troupe. 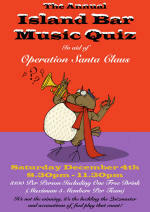 Free, sponsored by District Council, organised by LCSD. Website, poster. 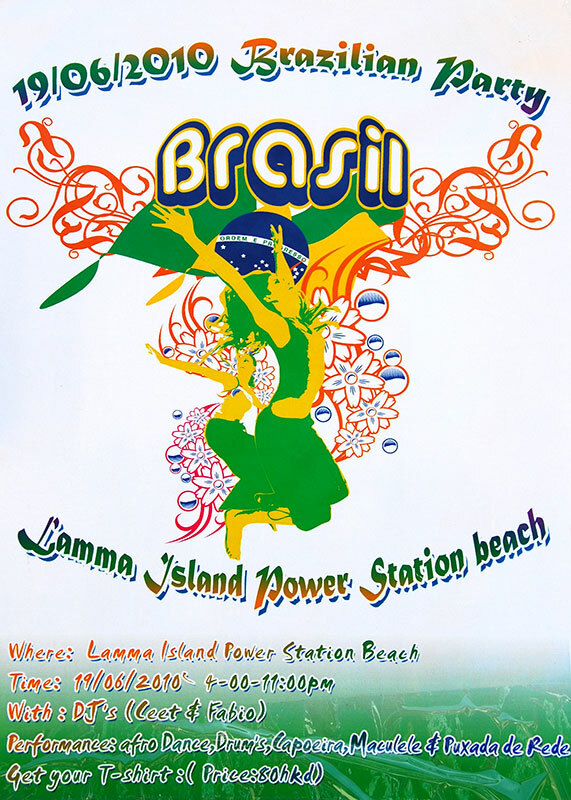 Power Station beach: DJs, Afro Dance Drums, Capoeira, Maculele & Puxada de Rede. Poster., email, website. Art Students of Lamma Exhibition: Fri, Jun 25, 5pm - Sat, Jun 26, 5pm: Banyan Bay Cafe (Cath's Bar): Roz Keep is displaying some of the work of the kids from her art classes. Red Star Rising: Sat, July 3, midnight: The Wanch, 54 Jaffe Rd, Wanchai. Website, poster. Guided tour to Kowloon and beyond, Megabox, noodle factory, etc, District Council-sponsored, $75, including Korean BBQ lunch. Contact Lamma- donna's office. Poster. Acoustic set at 9pm with Tai Burnette, followed by Pete & Elle; 10:30pm Dark Himaya take the stage performing original music. "...dedicate this gig to Keith and Lauren who will be tying the knot on the July 25 in Texas. Keith Woodfin is Dark Himaya's drummer. wohoo!!" Facebook event. 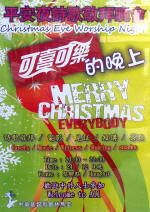 OTTO Lounge, 4/F Grand Progress Bldg, 15-16 Lan Kwai Fong, Central: Website, poster. 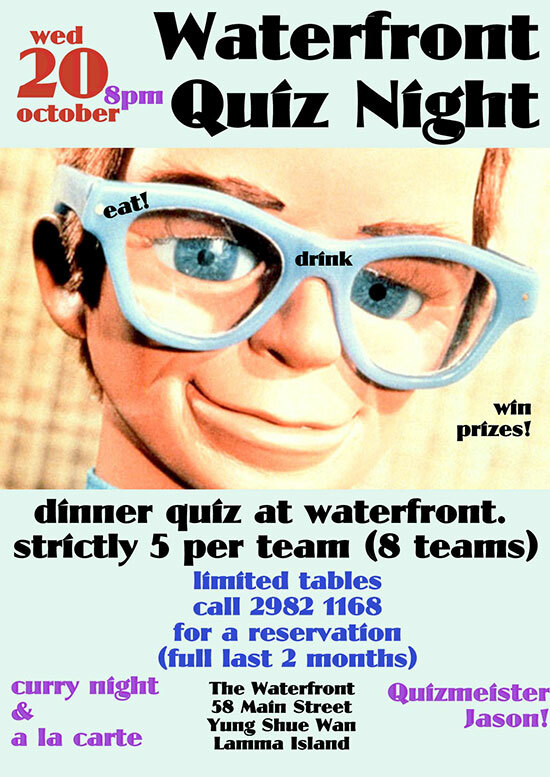 Quiz Night: Wed, Aug 11, 8pm: Waterfront Bar & Rest. : poster. 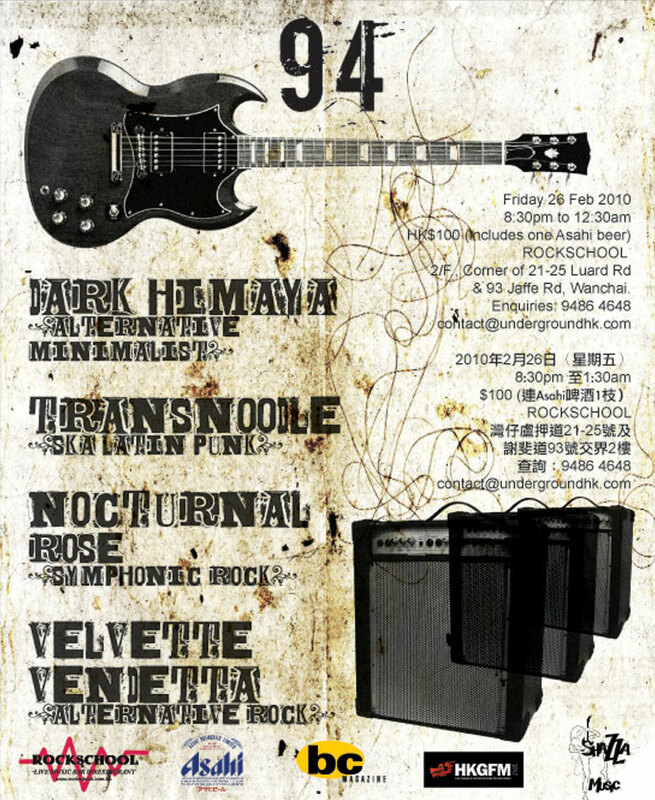 Transnoodle: Fri, Aug 13, 8pm: Rock School, above Joe Bananas, Lockhart Rd., Wanchai: Facebook. Dark Himaya w/Black Seraphine: The Wanch, 54 Jaffe Rd, Wanchai, HK: Facebook. 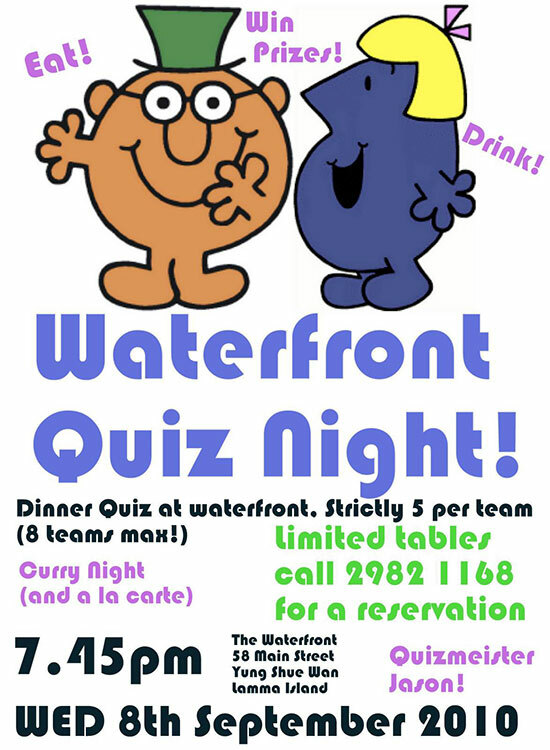 Quiz Night: Waterfront Bar & Rest. : poster. 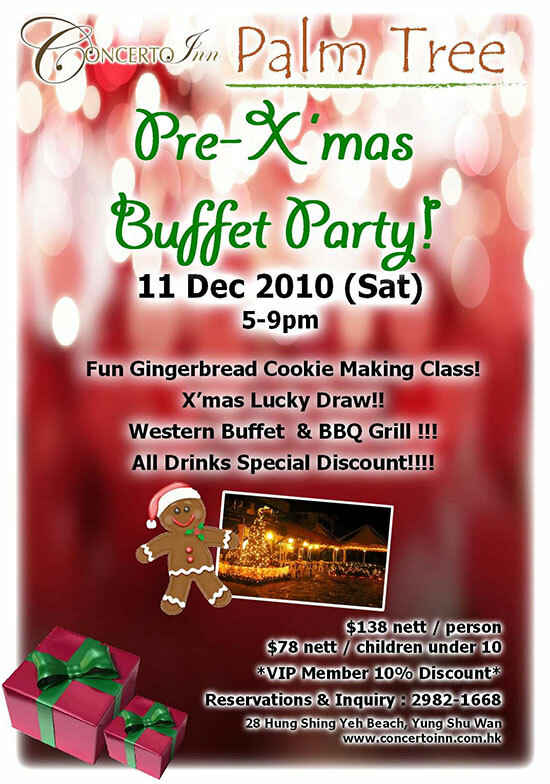 Free Mid Autumn Tasting Party: Concerto Inn rest., Hung Shing Yeh beach: Introducing a new chef and menu. Website. 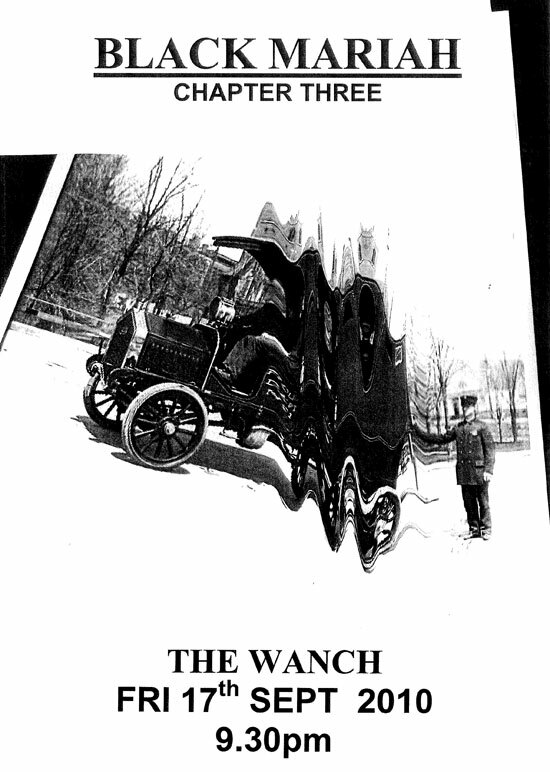 Black Mariah: The Wanch, Wanchai: I. Poster. Bookazine Prince's Bldg, Central. 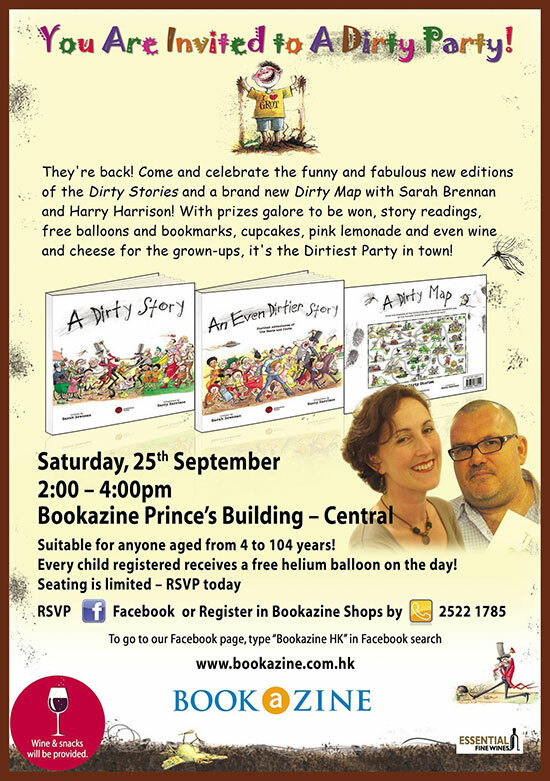 Book launch by Harry Harrison & Sarah Brennan: poster. 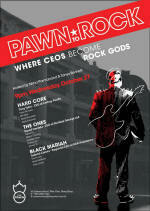 2/F 8 Back Street YSW: Poster. Bookworm Cafe: Very first meeting of this new branch of the well-established, long-running HK Philo Cafe. 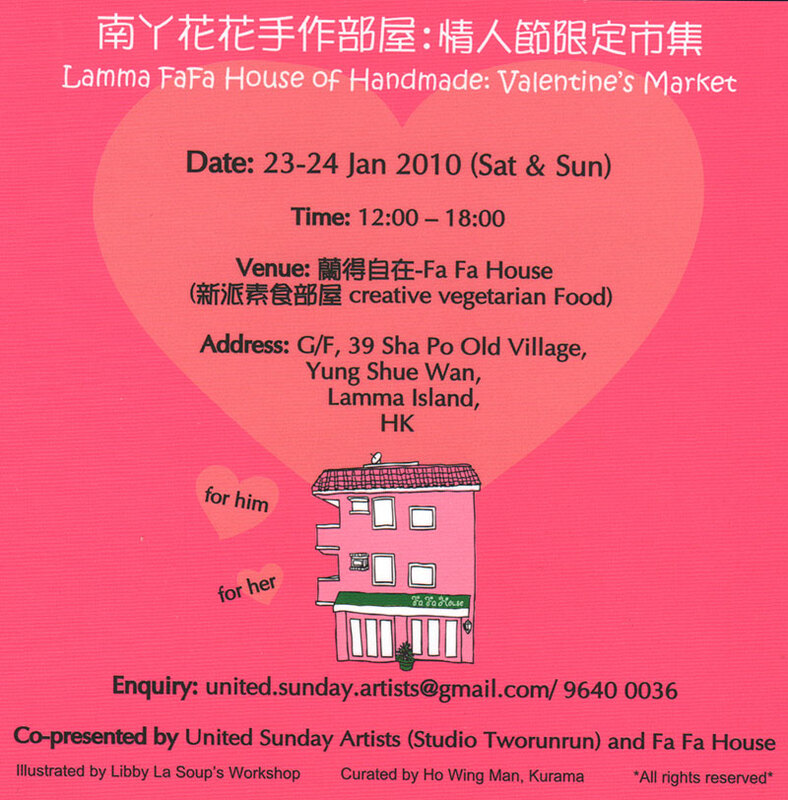 Poster, Lamma-zine story, forum. 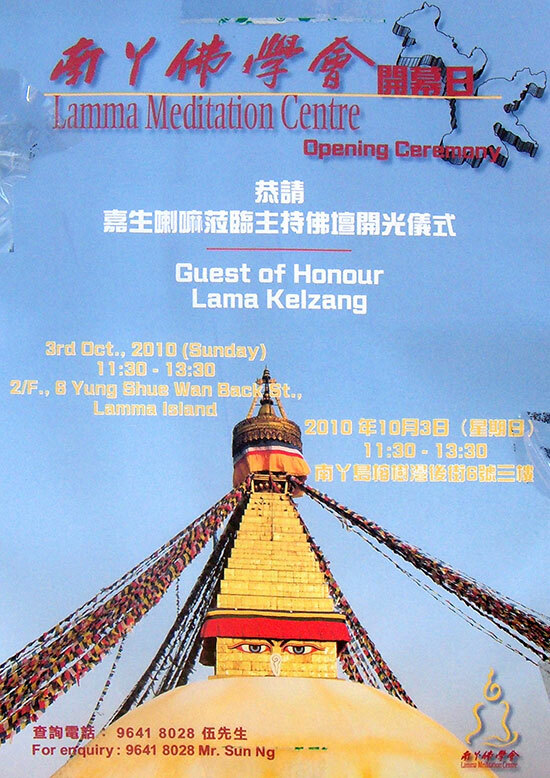 Lamma Meditation Centre, 2/F, 8 Back Street (just above Lo Yau Gei rest., left of Best Day and Best Kebab rest. ): poster. 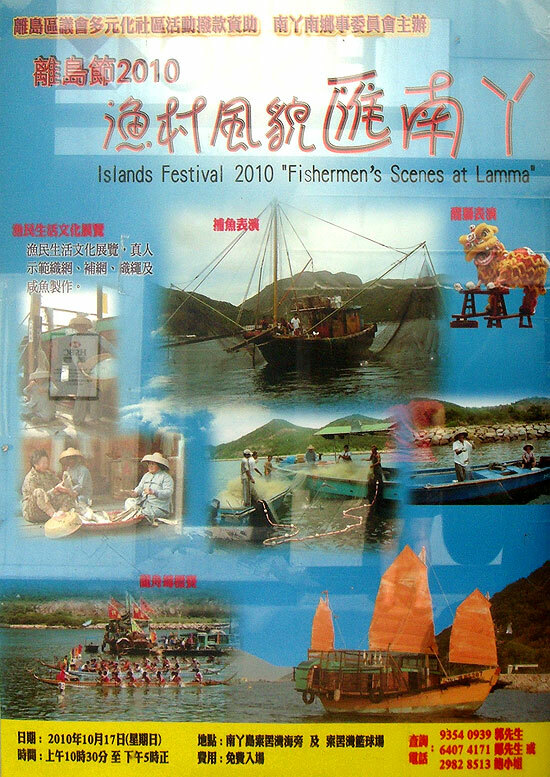 Islands Festival 2010 "Fisher- men's Scenes": Sun, Oct 17, 10:30am-5pm: Sok Kwu Wan waterfront: poster. 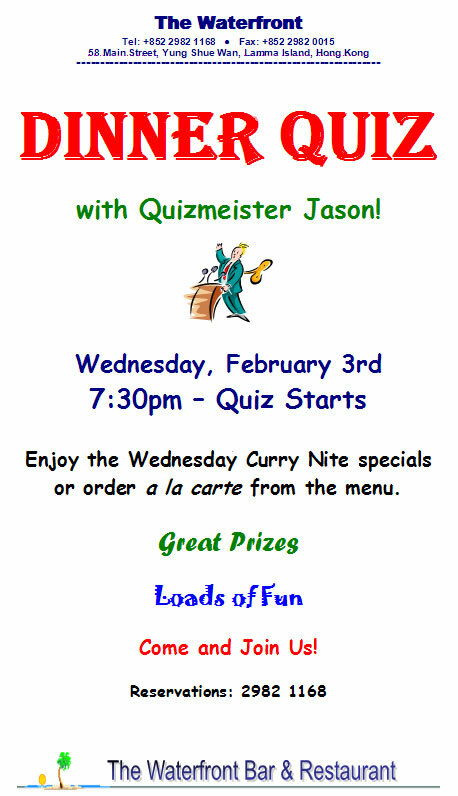 Curry Night & a la carte. 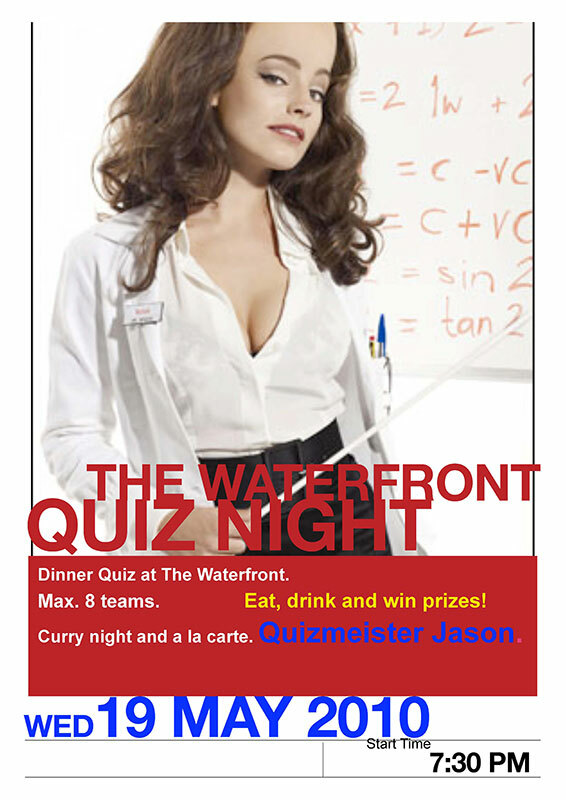 Quizmeister Jason, poster, call 2982 1168. Poster, email, Tel. 2866 3444. Lamma Island's *FOUR* Scariest Bands *Raise the Dead* in Wanchai! SEE The Curs shockabilly alt.country jug-band blasphemies. HEAR Transnoodle tackle Blue Oyster Cult. DRINK because you'll bloody need to. *SAMPANS WILL BE HAPPENING* 2143 6008. 1st show @ back of Lung Kong Sichuan Rest. (next to Deli Lamma): start 4:40pm, screening 5pm, end 6pm. end till late. More details. "We Are Funny Ghosts", free, in Cantonese, supplemented w/Eng. 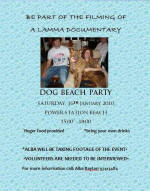 Nga Kau Wan (below the DickStock Residence, Dog Beach): Contact Jo (9042 3241) of Living Lamma, poster/forum. 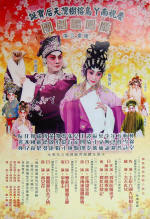 G/F, 13 Sha Po Old Village: Contact Tavis, poster/forum. 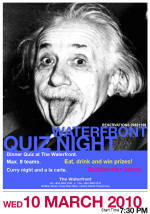 Quiz Night: Wed, Nov 17, 7:45pm: Waterfront Bar & Rest. : poster, max 5/team, call 2982 1168. 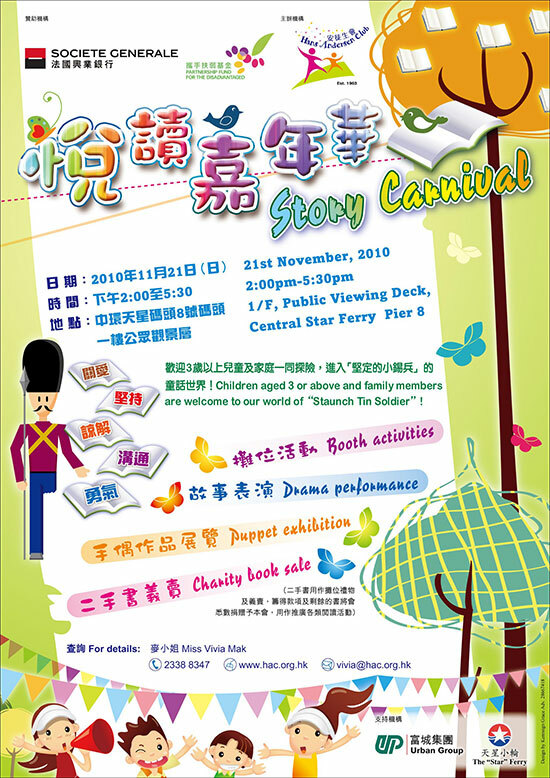 Story Carnival: Sun, Nov 21, 2-5:30pm: 1/F, Central Star Ferry Pier 8: by Hans Andersen Club. 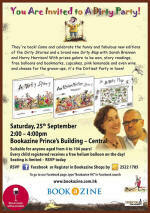 Booths, drama, puppets, book sale. Poster, email. Jo Wilson (9042 3241) writes: "starting at the pagoda near the Fishermen's Village and coming along the path back towards the library - all welcome. There are a couple of beach areas to go at on that stretch. 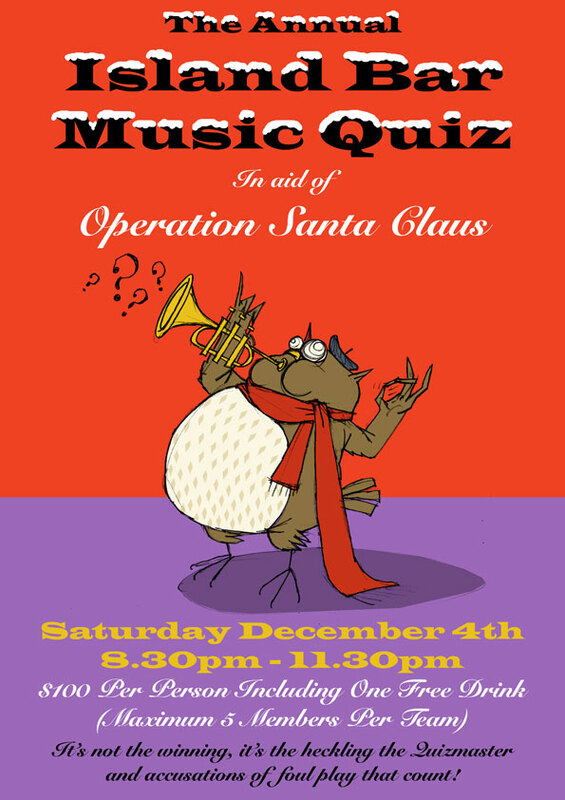 I have bags and gloves - just need some volunteers." 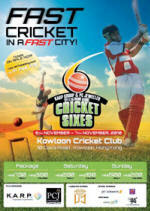 Children's Variety Show: Sat, Nov 27, 3-5pm: Basketball Court, Sok Kwu Wan: Details. Free. 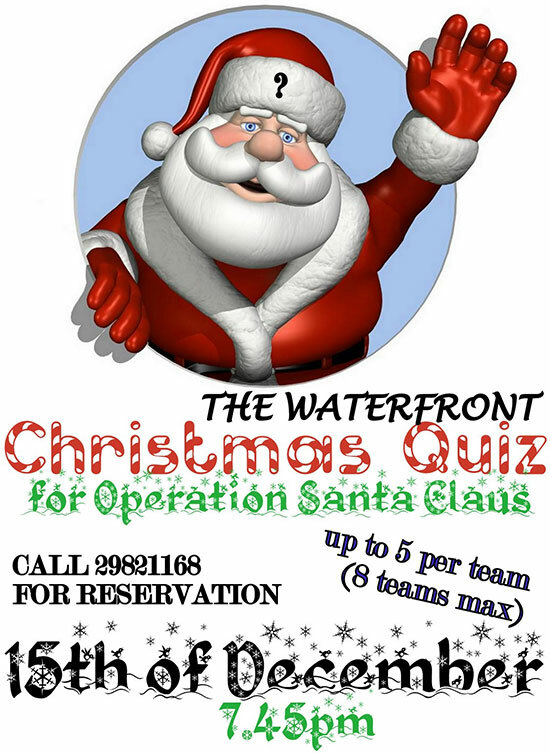 Call 2591 1340, Sponsored by Islands District Council. 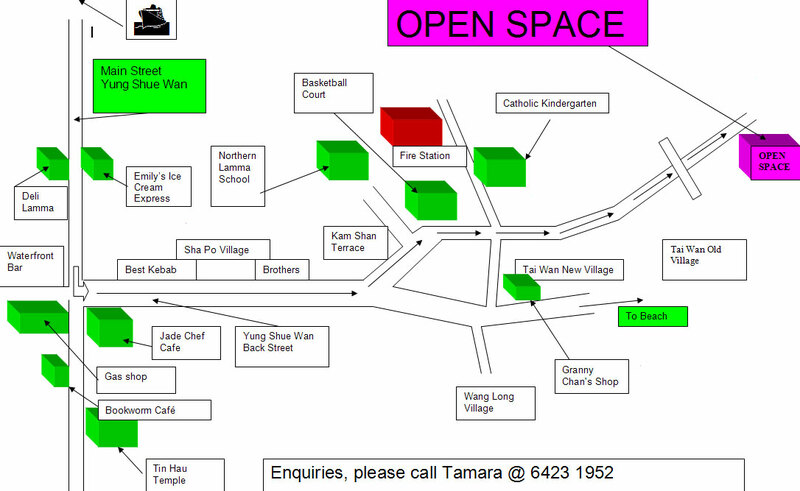 Open Space, Tai Ling (half way up to Lamma Winds via the Cath. Kindergarten): Facebook, poster. "Arts and crafts, games, BBQ, cartoons on the big screen.... $50 per child, adults free, meat & veggie BBQ and beverages available for purchase." 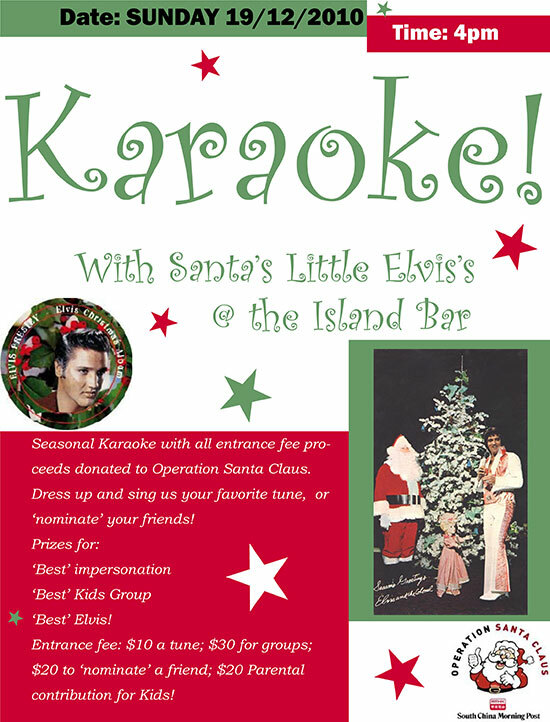 Island Bar: $100/person, incl. 1 free drink, up to 5 team members, poster. "It's not the winning, it's the heckling the Quizmaster and the accusations of foul play that count!" 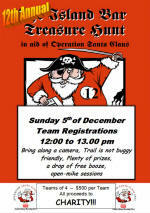 Treasure Hunt: Sun, Dec 5, 12noon: Island Bar: Team registrations 12noon-1pm. Bring along a camera, trail not buggy -friendly, plenty of prizes. Poster. Makumba Africa Bar Lounge G/F, Garley Bldg, 48 Peel St, Soho: DESKARATS (8 pieces ska band from Spain) Debut Asian Tour 2010. MySpace. 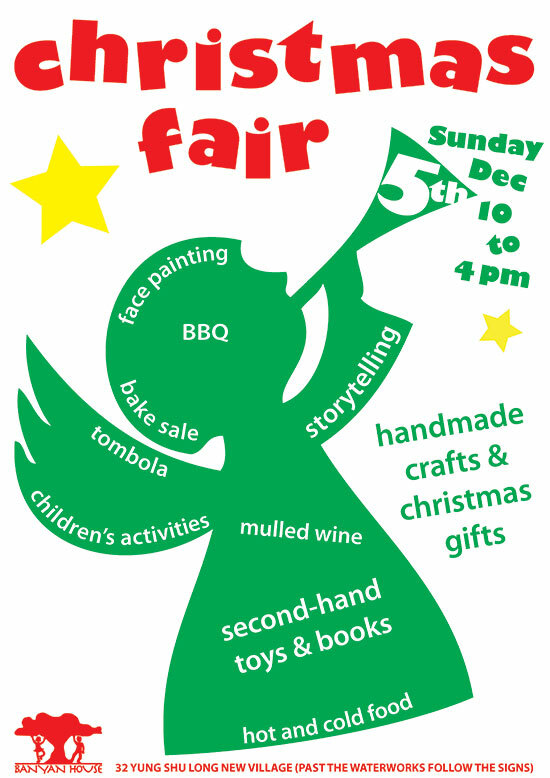 "Face Painting, Children's Activity, Crafts, BBQ, Bake Sale, Tombola, Storytelling, Handmade Crafts and Christmas Gifts, Hot and Cold Food and Drinks, Mulled Wine, Second-hand Toys and Books." Poster. 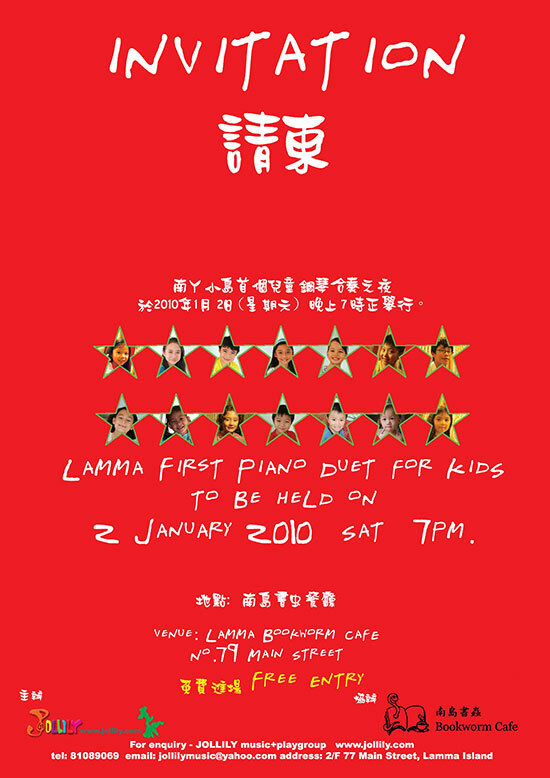 Bookworm Café: Lamma Spirit Branch of HK Philosophy Cafe. 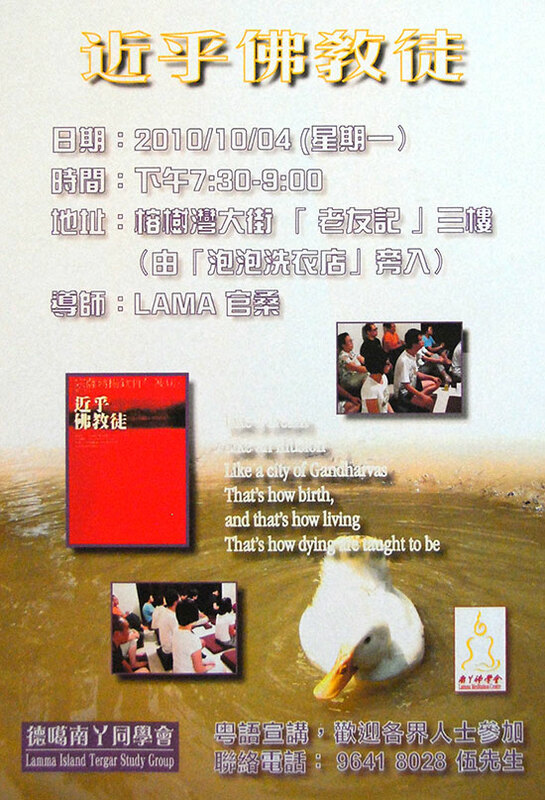 Topic: "Should Lamma be more civilized? - The pros and cons of modern civilization". 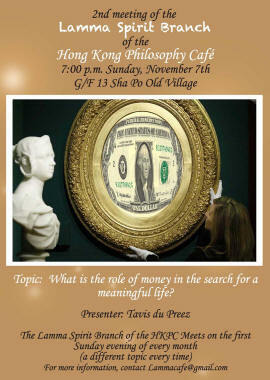 Presenter: Christopher Dyck, Moderator: Tavis du Preez. Forum. YSW Football Pitch: by Rico Tsoi Dance Centre. 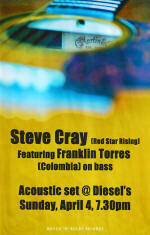 Notice, flyer. 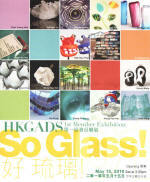 ifc Bookazine, 3/F, Shop 3022, ifc Mall: Free, complimentary wine tasting from 2:30pm, Website, poster, 2295 0056. Palm Tree Rest. : $138/person, $78 children under 10. Website, poster, call 2982 1688. Lunch, traditional Chinese Opera singing, age minimum 55. $50. 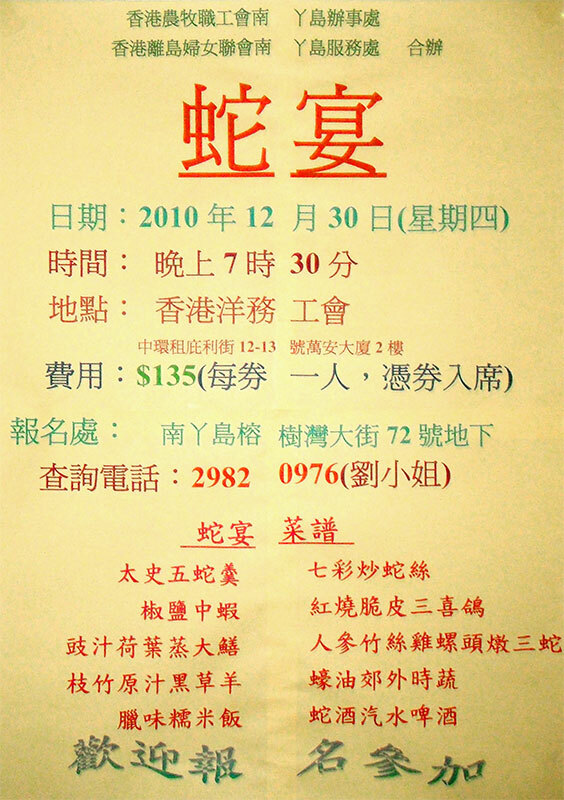 Call 2982 0976 (Ms. Lau), poster. 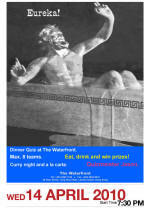 Wed, Dec 15, 7:45pm: Waterfront Bar & Rest. Sale of jewellery, candle bowls and chandeliers. Free, call Paul at 2982 2173 or email him. Details. Free, for age 6 and above. Free; call Paul at 2982 2173 or email him. Details. 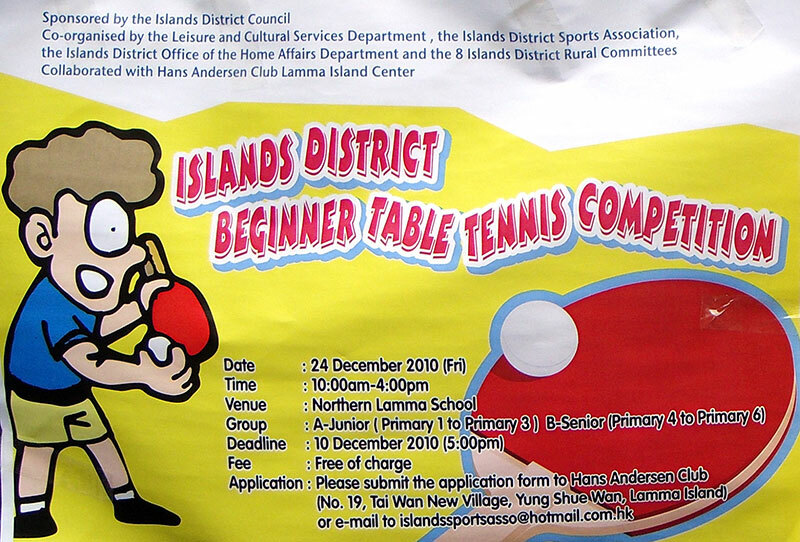 Beginner Table Tennis Competition: Fri, Dec 24, 10am-4pm, Northern Lamma School. 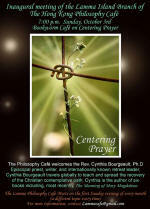 Free, registration deadline Dec 10. Poster. 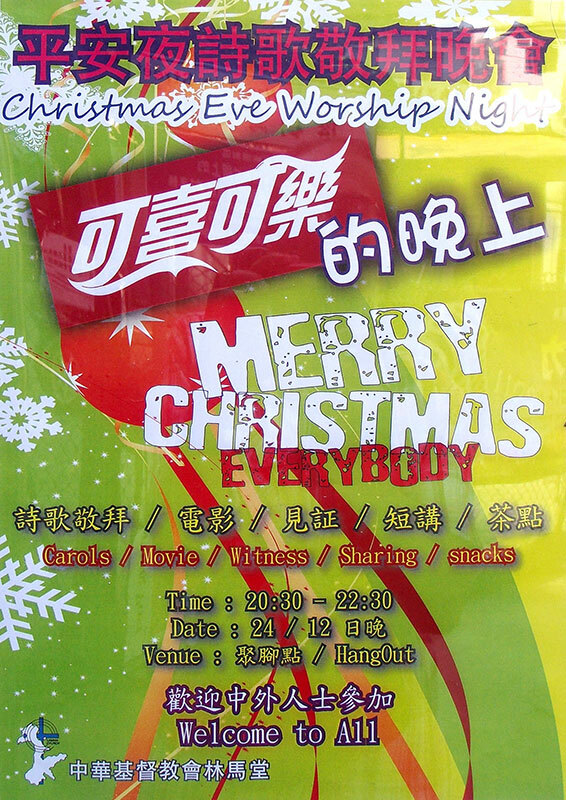 Christmas Eve Worship Night: Fri, Dec 24, 8:30-10:30pm, Hangout, 1 Back Street (beside Pizza Milano): All welcome; carols, movie, witness, sharing, snacks. from Power Station Beach to Island Bar: details. 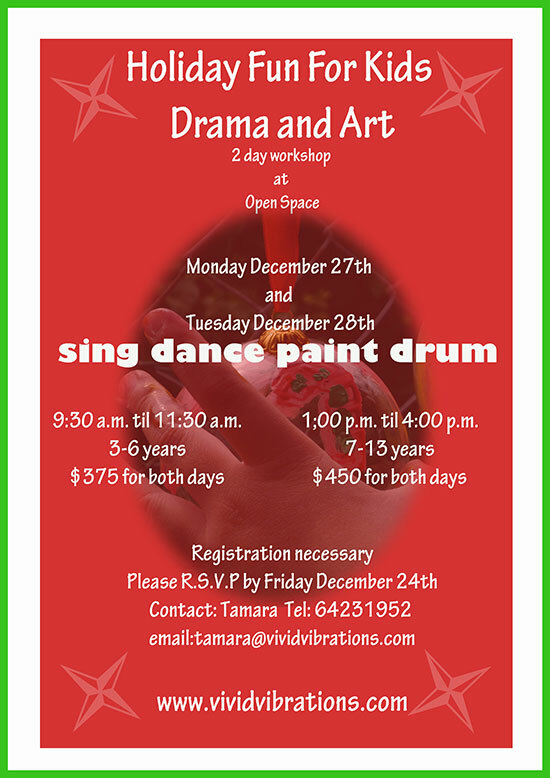 2-day drama & art WS for kids (3-6 and 7-13). RSVP necessary, email or call Tamara 6423 1952. Website, poster. Flower, Bird, Insect & Fish tour: Tue, Dec 28, 9am-late afternoon, All-day tour to Fanling, including lunch: Call 2982 0976 or visit Lammadonna's office on Main Street, just after Lamma Gourmet. $70/person, poster. Yearly Snake Dinner: Thu, Dec 30, 7:30-10:30pm, Snake Rest. 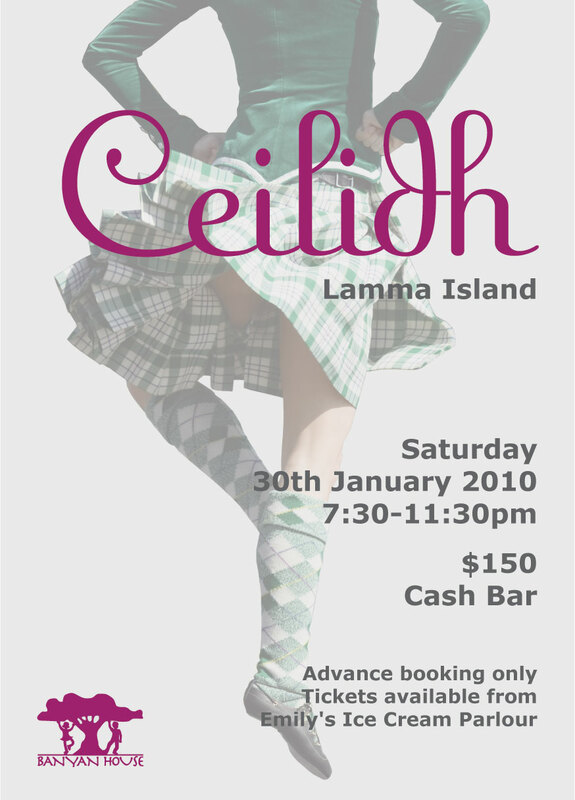 in Central: Call 2982 0976 or visit Lammadonna's office on Main Street, just after Lamma Gourmet. 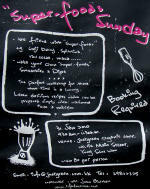 $135/person, poster & menu. Sok Kwu Wan to camping in Tung O (to take pictures of daybreak). Free, call Paul at 2982 2173 or email him. Details.